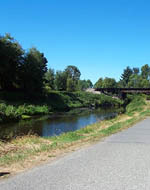 The Sammamish River is primarily a migratory corridor for chinook, coho, sockeye and kokanee salmon and steelhead trout that spawn in Issaquah, Bear, Little Bear, North, and Swamp Creeks. Limited rearing of juvenile salmon may occur in the river. Poor water quality, fish access and passage barriers, and degraded riparian conditions are among the factors contributing to salmon habitat decline in the subarea. Salmon habitat projects in the Sammamish River Subarea funded through the WRIA 8 collaborative process are now included in the Habitat Work Schedule (HWS) state-wide website. In the website, click on the WRIA 8 watershed on the state map to enter our HWS website.